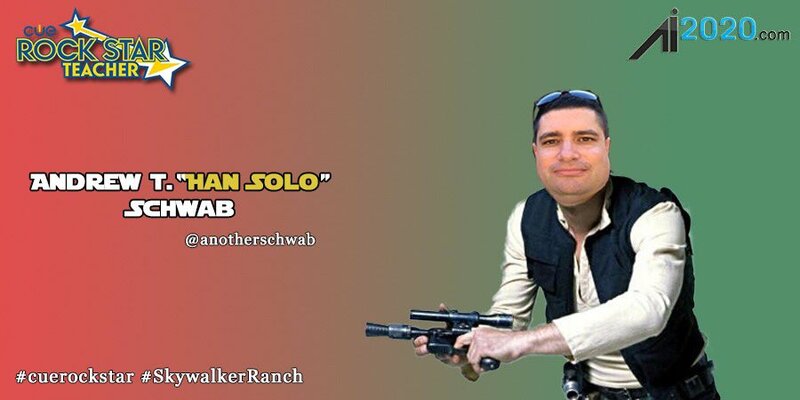 Big thanks to @adnanedtech for memorializing my Rockstar Admin experience forever. Day 2 of CUE Rockstar Admin Camp started off strong with #edugrandpa Jon Corippo going all Captain Chaos on us with a book study by frayer activity. The frayer template is one of those simple little things I wish I knew about when I was teaching, because I would have been telling every one of my fellow teachers about it. Together with other simple instructional strategies like PowerPoint Karaoke, Somebody Wanted But So Then, Iron Chef Lessons and good old fashion Blogging, students could be empowered with a robust learning framework without feeling like they are always starting over at “I don’t know how to do that”. For session number two, I wondered into Catina Haugen’s session on PD. Catina had a lot of great ideas to share but I actually left early because I’m very fortunate to work in a district that already has a lot of exceptional PD going on at the moment. And because I needed more hot tea. And because, “Rule of 2 Feet”. By happy accident on my way to find tea, I happened upon @PrincipalDurham lounging in one of the incredible rooms at Skywalker’s Big Sky Ranch. We had a nice chat about the challenges inherent in providing relevant edtech Professional Development for teachers and how the focus really needs to shift from Tech Tools to Lesson Design. One thing about the location for this Rockstar Admin Camp is the incredible spaces. There are great spaces where you can just sit down and enjoy the amazing views all over the place. Sadly, no pictures allowed inside, so you’ll just have to imagine it, or sign up to attend next year. But I digress. StarWars In The Classroom stopped by for a mini-keynote. They are a group of teachers using the Star Wars Universe to connect kids to learning. As the kid whose first movie ever was Star Wars (back when Han shot first and before there was such a thing as a New Hope), I really wish these Rogue teachers had been around back in the day. Rockstar Admin Camp has already been a great event and Day 3 is still to come. Let the Hero’s Journey continue! Please note that quote was stolen from Mr. Wood and only slightly modified, if at all.